Ethanol free, high octane fuel mixed with Husqvarna’s best synthetic blended oil. The best premixed fuel option for the best handheld equipment. Ethanol fuel, or ethyl alcohol, is an alcohol additive that is commonly used in nearly all gasoline in the United States. It is derived from renewable sources such as corn, sugar cane and wheat. If you buy your gas at a gas station in the U.S. then more than likely what you are buying contains corn-based ethanol. This gas, composed of 90% gasoline and 10% Ethanol, is sometimes referred to as E10. Nearly all gasoline sold in the United States contains Ethanol even if there is not a declaration of ethanol on the pump. 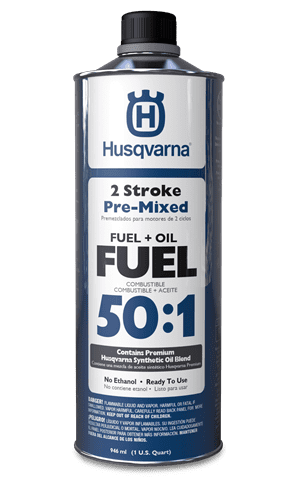 E10 can be used in all current Husqvarna equipment, however, we recommend using at least 89-octane E10 gasoline, which is the mid-grade between regular and premium gasoline. Fuel that is labeled E15, E20, E85 and diesel fuel are not acceptable alternatives to E10 and will cause significant damage to outdoor power equipment. Look for an indicator at the gas pump to make sure you’re making the right choice. Not all states require that the ethanol level be identified at the pump. In these circumstances, make sure you do your own research. Storing Gas – Not so Simple! Because today’s gasoline contains ethanol, an alcohol, it absorbs water if exposed to air. In many cases, the operator is unaware that their gasoline has become contaminated with water, and unintentionally pours it into their unit. This is because your fuel mixture will separate into layers if it contains a high enough percentage of water. If you don’t shake your mixture, you may unintentionally pour a damaging concentration of water into your unit. Always vigorously shake the fuel mixture immediately before pouring. Purchase only enough fuel to last about 30 days. This helps assure that you are always using fresh, uncontaminated gasoline. For two-stroke engines, only mix enough fuel that will be used within the next 30 days. In order to store the fuel with as little exposure to air as possible, avoid containers with vent caps. Look for containers that are air tight and that also provide tight seals around the cap. Fuel stabilizers can be helpful in extending the life of the product while also defending against the absorption of moisture. For maximum benefit, fuel stabilizers should be added to your gasoline at the time of purchase. While using a stabilizer extends the life of the gas, a two-stroke gas/oil mixture with a fuel stabilizer should not be stored for more than 90 days. Using Husqvarna two-stroke oil will help reduce the risk of engine failure and poor engine performance by helping to prevent the fuel from becoming stale. Whether you are a professional landscaper or homeowner, always keep the caps secure on your gas containers between jobs. Even exposing your gas to air for a short period of time will allow it to absorb detrimental amounts of water. Before storing your unit for the season, make sure you drain the fuel tank and run the unit until it’s dry. 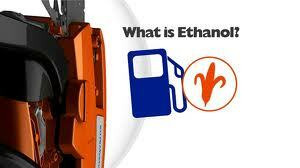 Most units that were made in the last five years have components that are resistant to the effects of ethanol. However, older units should never be stored with fuel in them since the fuel lines could be affected by the Ethanol found in today’s gasoline. By taking the time to understand the issues surrounding today’s gasoline you are more likely to enjoy a long-term, productive relationship between you and your Husqvarna power equipment. If you are looking for the best outdoor power equipment such as lawn mowers, lawn tractors, garden tractors, leaf blowers, snow blowers, snow throwers, chain saws, trimmers, hedge trimmers, bed edgers, brushcutters, power cutters, and more. The showroom at Gamka Sales Co. has the full line of Husqvarna outdoor power equipment on display for landscapers and homeowners. Husqvarna Group – a global leader in outdoor products. Just make sure you always use pre-mixed fuel in all your 2-stroke engines for the longest life and best performance.